Thrilling adventures, compelling characters, creative plots and twists readers will never see coming! Writing fiction can be as entertaining to write as it is to read, but every good writer needs a good push to get things flowing. These prompts are designed not only to get the creativity flowing, but also to help you improve your technique and experiment with different writing styles. 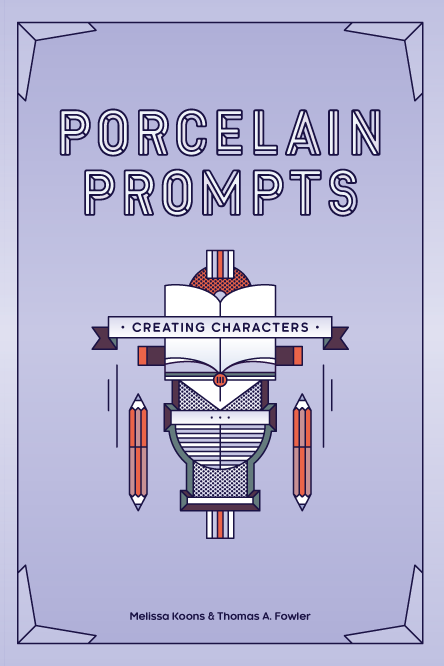 Porcelain Prompts: Fiction, features 20 prompts from a variety of fiction genres and styles to give your creative process the flush it needs. Have too many ideas? Getting stuck and unsure how to transition? Outlining your novel or story is an important skill to develop to be able to reach that oh-so-satisfying completion. If you’re not an organized writer, or have never tried to outline before, do not fear! These prompts are designed to help you find whichever organizational outline works best for you and your story. 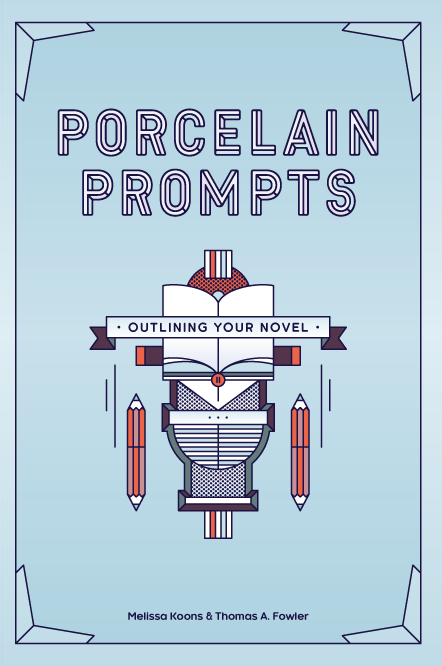 Porcelain Prompts: Outlining Your Novel, features 20 prompts with a variety of strategies and questions to get help your thoughts become more cohesive so that you can drop that novel in its completeness. Adventure, intrigue, twists and surprises are all parts of an entertaining story but if you don’t have quality characters to drive it forward, then all the entertainment in the world won’t keep your readers engaged. Your characters are the heart and soul of your story, and without proper development it can make your story come up short. Porcelain Prompts: Creating Characters, features 20 prompts intended to make you think deeper about your characters and all the little nuances that make them relatable, multi-dimensional, and memorable. Taking the high road is easy, but taking the low road and making it look appealing—now that’s talent. A great hero is only as good as their villain. Without a villain, there is no conflict or moral dilemma; the hero simply wins and isn’t that dull. Writing a great villain is delicate work. These prompts will help you determine what is your villain’s motivation, why they chose the low road over the high road, and how can they make that choice look like the right one to make. Porcelain Prompts: Villains, features 20 prompts that will make you think differently about the villain and let you explore writing different types of big bads. Everybody can rally behind a good hero: someone who saves the day just in time. What makes a hero great? What makes readers rally behind them and want to watch them succeed? Creating a great hero or even a good hero is harder than you may think. These prompts are intended to get you thinking outside the traditional hero box, and start creating heroes that have depth and a uniqueness to them that will be refreshing. Porcelain Prompts: Heroes, features 20 prompts which will make you delve deeper into what motivates a hero, the different types of heroes, and the boring pitfalls you’re hero should avoid.